Huawei has posted an image pointing at the launch of Honor 7 on June 30 in China. Huawei’s Honor 7 has not been a secret and we had reported about spotting its shell back in April. The innards of the Honor 7 were confirmed based on the benchmark listing screenshot. The Honor 7 smartphone is rumored to be crafted from aircraft-grade metal and pack a 5-inch 1080p display. The regular version of the Honor 7 will feature 3GB of RAM and 16GB of on-board storage. This edition is powered by the home-grown Kirin 935 mobile chipset which can easily drive high quality video and 3D games. At the rear is a 13MP camera with autofocus, LED flash, and optical image stabilization. Huawei has packed the Emotion UI 3.1 based based on Android 5.1 Lollipop. 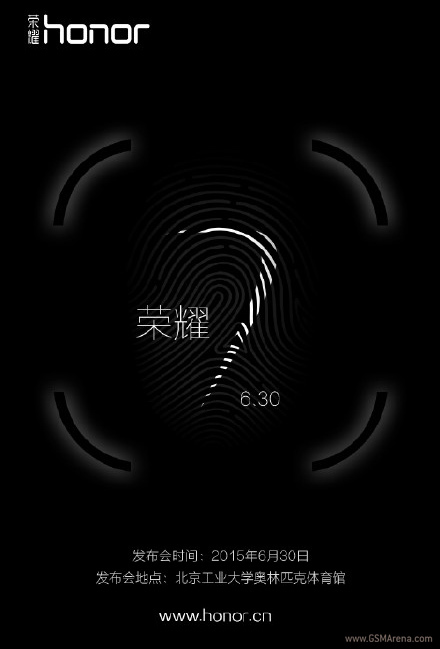 The teaser invite also shows a fingerprint sensor which was already confirmed through previously leaked images. The fingerprint sensor will rest at the back, under the camera. It isn't out yet so keep an eye out for user reviews.